Home Lifestyle Is Your Office Job Killing You? A sedentary lifestyle is the modus operandi for millions of people. But all this sitting is incredibly unhealthy and even dangerous. Do you have an office job where you sit most of the time? If you do, you need to understand how it’s affecting your health. You might just want a new job. So, what exactly does it mean to live a sedentary lifestyle? Let’s take a look at what we need to do to be physically active. The Centers for Disease Control and Prevention (CDC) state that individuals should get either 150 minutes of moderate exercise, or 75 minutes of more rigorous exercise each day. Another marker of an active lifestyle involves walking approximately 10,000 steps per day – that comes to about five miles each day. These guidelines can help individuals avoid a sedentary lifestyle, stay healthy, support mental health, and prevent the onset of disease and physical degeneration. The only problem is, most people aren’t getting enough physical activity into their day. According to the World Health Organization (WHO), between 60 and 85 percent of the entire world’s population doesn’t get enough physical activity. In short, about 1 in 4 people aren’t moving enough. Chances are, you’re part of this majority. But what does that mean for your health and wellness? Yes, you read that right. Sitting too much can be downright fatal. It can increase the risk of dying from lots of different causes, as one large review found. 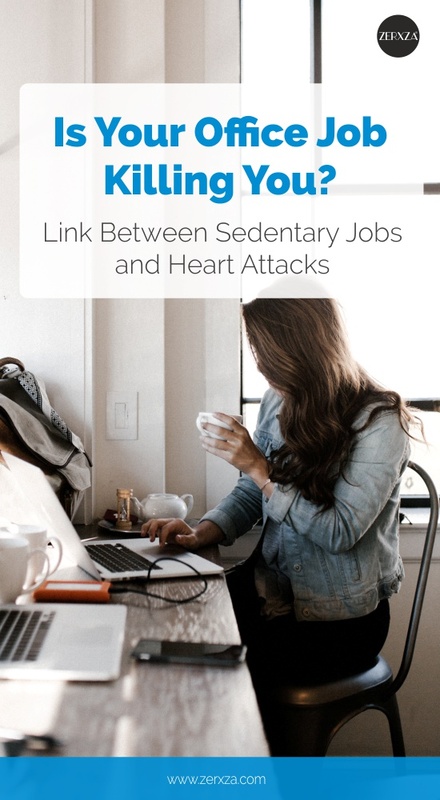 In fact, a sedentary lifestyle is considered to be one of the 10 leading causes of disease and disability throughout the world, including “noncommunicable diseases such as cardiovascular diseases, cancer, and diabetes,” according to the WHO. On top of these physiological risk factors, research also shows that a sedentary lifestyle can increase the risk of mental health disorders, including depression. Back in 2015, a large review was published in the journal, Annals of Internal Medicine. Researchers found that even after accounting for different factors, long periods of sitting had a strong association with heart disease. Other studies help to explain why that is. One study, for example, shows that high levels of sedentary behavior are associated with higher blood pressure. Physical inactivity has also been associated with pulmonary embolism, according to a study published in the British Medical Journal. In case you’re not sure what a pulmonary embolism is, it’s when an artery inside the lung is blocked. Another study found that prolonged sitting and immobility was a common risk factor for something called “venous thromboembolism.” This is the medical term for blood clot formation in the deep veins of the arms, legs and groin area. The more time you sit, the higher the risk of heart failure, according to the American Heart Association (AHA). Another study found that for every hour we sit, there’s a 14 percent increase in coronary artery calcium store. In other words, we need to move to keep our arteries strong and healthy and to prevent an accumulation of calcium deposits. A sedentary lifestyle is terrible for cardiovascular health. It increases the risk of heart disease, high blood pressure, pulmonary embolism, venous thromboembolism, and clogged arteries. Yes, many of us have to sit for long periods of time. But it’s silently killing us. So, what can we do about it? It’s time to get moving. There’s no way to avoid the health risks of a sedentary lifestyle unless you get active. This might seem like a formidable task, especially if your job requires you to sit for most of the day. In recent years, standing workstations were popular, saying they could help you burn calories, lose weight. Plus, they were promoted as a healthy alternative to sitting all day. However, a 2017 study found that standing for extensive periods of time wasn’t great for your heart either and that it could actually increase your risk for heart disease. So, if both sitting and standing for long periods of time is bad for your heart, what can you do? You don’t have to be a gym rat to start protecting your heart. But you do need to start moving. Can you park further away from the building entrance and add steps to your day? Can you stand, instead of sit, when commuting – on the bus or train, for example? Can you bike instead of driving? Can you replace TV watching with other activities that keep you moving? For example, can you listen to your favorite podcast episodes while walking? Or do household chores while listening to your TV show – this might not sound “fun” but at least it keeps you moving. If you take a phone call or spend any time on your phone, can you do so walking, or at the very least, standing? Another idea is that when you meet with friends or colleagues, suggest walking meetings, like media maven and Huffington Post founder, Arianna Huffington, does. Everyone feels better, gets fresh air and most importantly, everyone moves. If you have a lunch break, spend it walking. Hey, if you have any break, spend it moving. And if you have the choice between taking the elevator, escalator or the good, old stairs – take the stairs! Yes, it’s work, but it’s worth it. If you work out, aim for 30 minutes per day. This can be running, biking, a mix of cardio and strength training, yoga, pilates, HIIT, etc. Remember, it’s great to workout, but it’s even better to integrate movement throughout your entire day. In short, make movement a part of your lifestyle, and not just part of your fitness routine. In this way, you can help protect your cardiovascular health and defend yourself against heart attacks. Previous articlePossessive Behavior and Jealousy in Relationships: What to Do About It?